Contrary to much of our expert thinking, the world is not flat, no matter how smoothly technology seems to flow across borders. That misperception comes from believing the myth that globalization is primarily a technological and economic process, not a social and political one. It has led us to think we need to compete with Asia over the “hardware” of globalization and engage in a new arms race, one defined by investment in communications, education, basic research, and infrastructure. Although these factors are not unimportant, we must begin to understand and nurture the “software” of innovation — the politics, community, and identity that can encourage innovation or stifle it. These are more important both in terms of shaping technology development in Asia and offering the United States an opportunity. We cannot overcome the hardware advantages that Asia will inevitably enjoy yet we have a significant advantage on the software side. Investing in and cultivating that mastery is our best hope for maintaining the competitive position of the American economy. 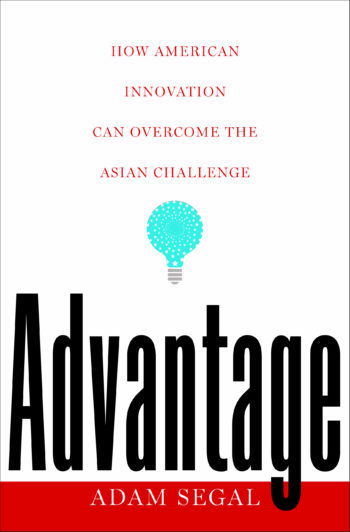 Advantage sorts out the challenges the United States faces and focuses on what drives innovation, what constrains it, and what advantages we have to leverage. Adam Segal, an expert on technology and foreign policy, recasts the stakes of the debate. His book is a resounding call to tie innovation to larger social goals in an age of global science and technology. A new framework for thinking about the East-West innovation competition. Thoughtful . . . . [Segal’s] striking argument is that the challengers [India and China] lack America’s resilient, open and risk-taking culture. A well-reasoned antidote to gloomy views of American decline.